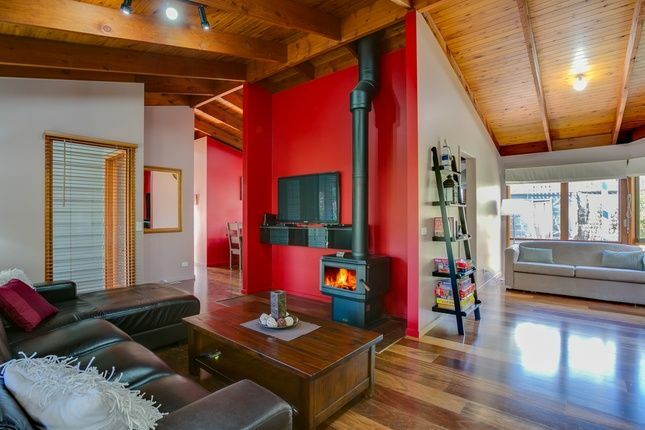 Anakie Lodge offers a unique and versatile option for your escape to the Mornington Peninsula. Recently renovated, the home itself is an ideal haven for rest & relaxation and indoor/outdoor entertaining. Suitable for up to 10 guests, the highly flexible floor plan comprises three bedrooms (BIRs, master with FES & WIR), fully-equipped hostess kitchen and generously sized living and dining areas. A home for all seasons, the outdoor environment is highlighted by an extensive decked area with BBQ facilities whilst the interior is adorned with creature comforts such as Coonara Wood Heater, ducted heating and air conditioning as well as a media centre with over 400 movies for your enjoyment. View the Gallery for photos of the property. Impeccably located in an exclusive court locale where the natural environment has been preserved, enjoy walking proximity to Arthurs Seat State Park, Rosebud Park Public Golf Course and local shopping facilities whilst Rosebud Beach (Jetty), Peninsula Hot Springs and Rosebud Plaza are only a short drive away. ** STAY 2 NIGHTS MIDWEEK RECEIVE THE THIRD FREE. ONLY VALID FOR WEEK NIGHTS MONDAY TO THURSDAY. DOES NOT APPLY FOR HIGH SEASON, SCHOOL AND PUBLIC HOLIDAYS. Please contact us, so we can package Hot Springs Bath passes into your stay. Passes available are priority passes which don't require you to pre-book with the Peninsula Hot Springs and valid for 12 months. Both the young and young at heart are spoilt with entertainment options with a media centre (400+ movies) accessible from any of the Plasma TVs in each of the bedrooms or the 55inch Plasma TV serving the main living area. Additional entertainment devices include DVD player, Wii console and Playstation. We have recently had NBN connected to our Property and now offer unlimited WiFi and Netflix services to our guests. The kitchen pantry is stocked with an array of staples and essentials as well as a NESPRESSO Automated Coffee Machine. However we cannot guarantee that George Clooney will drop in ladies. Linen and Towels are an additional $20 per person (non peak) $25 per person (peak). Linen includes towels and bed linen for all beds required. Nespresso Machine. 10 free pods additional pods $10 for a sleeve of 10 pods. Well kept, home from home in a quiet court. We found our stay very comfortable and everything we could need was provided. Not too far from central Rosebud but away from the crowds. Myself and my family absolutely loved our stay at Anakie Lodge. The personal touchs to the property such as shower gel, shampoo and conditioner in the bathrooms is lovely. The wifi is fast and readily available and as coffee lovers we loved the nespresso machine. Everything you could possibly want in a holiday home away from home is thoughtfully provided. Theo is very responsive to any questions and promptly replies. Great property, very comfortable we loved the open fire. We enjoyed our stay, very much, 5 minutes to town, the beach and the wineries!! Fantastic house with all the modern features. Set in a leafy, quiet street that's very private. Great place. Very clean. Well located. Everything you need on hand. . Wonderful inviting home that me and my children loved. Wonderful home in a nice quiet court. We really enjoyed being able to unwind in the lounge room with the wood fire of an evening. We will definitely book this home again when we return to rosebud.